The day after Memorial Day weekend usually brings a lack of sleep, a hangover, and a sunburn. But today is also significant for Manhattanhenge, one of four days a year when the sun sets precisely along the Manhattan grid. The name "Manhattanhenge" was created by Neil DeGrasse Tyson, from the Museum of Natural History as a tribute to the city's most notable borough and the circle of stones at Stonehenge. Today at approximately 8:17 PM the sunset will be anything but ordinary, when a larger than life view of a half sun will be visible from every street corner in the city. For those that happen to miss tonight's sky show, it will also take place on Thursday, July 12th around 8:25 PM. During these two days a year the sun will set precisely half above the horizon and half below. If a half sun isn't enough to grab your camera, tomorrow, May 30th, at 8:16 PM and Wednesday, July 20th, at 8:24 PM you will find the entire ball of the sun visible as it is setting. "As far east in Manhattan as possible, but ensure that when you look west across the avenues you can still see New Jersey. Clear cross streets include 14th, 23rd, 34th. 42nd, 57th. The Empire State building and the Chrysler building render 34th street and 42nd streets especially striking vistas." 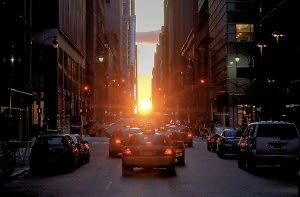 For more info on Manhattanhenge click HERE!